This image of Europa will appear as a security feature on the new breed of Euro banknotes, which will be unveiled next year. THE EURO BANKNOTES are to be given a redesign to include the image of the Greek mythological figure of Europa, the ECB has confirmed. ECB president Mario Draghi this afternoon confirmed that the banknotes would be given an overhaul, beginning with the €5 note, of which the new notes will begin circulation in May 2013. 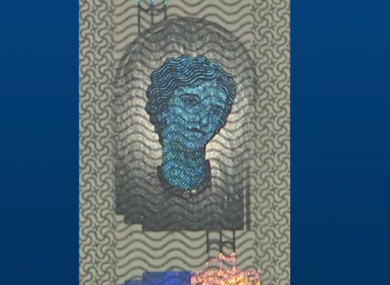 The new design will include Europa’s likeness in their watermarks and in the hologram that appears down the side of the notes – in a measure which Draghi said would benefit “from advances in banknote technology”. Three security features – the hologram, the watermark, and the inclusion of a coloured number ’5′ in the upper corner which – similar to the larger denominations of notes – will change colour from grey to emerald green when tilted. The other security features, and the final design of the note, will be unveiled at an event in Frankfurt in March. The image of Europa – the mythological figure who was seduced and abducted by Zeus – is derived from a vase housed in the Musée du Louvre in Paris. Bloomberg, which had news of the redesign several months ago, reported that the new notes would also include slightly different colours to the current range of notes. The notes are also expected to feature an expanded map of Europe to reflect the larger membership of the EU. The Euro notes and coins only became legal tender in January 2002 – when the EU had only 15 member states, most of them from the western part of the continent. Most Eastern countries joined the Union in May 2004, during Ireland’s last presidency of the Council of the EU. Draghi said the new design of notes would circulate in parallel to the current designs, with adequate public notice given before the first range of notes is no longer legal tender. The current notes will permanently be eligible for exchange at national central bank offices after they cease to be legal tender, Draghi said. More: Could Ireland ever become a totally cash-free country? Email “Euro banknotes to be redesigned with image of Greek 'Europa'”. Feedback on “Euro banknotes to be redesigned with image of Greek 'Europa'”.